We have covered every angle of the Graco 390 paint sprayer in our complete review. Learn everything about this tool and if it is right for you! When you have some serious painting projects to tackle, you need the best! With a 5/8-horsepower motor and the capability to spray up to 0.47-gallons per minute, the Graco 390 is a workhouse. Let’s take a closer look at this sprayer to determine if it will be the right model you need. Who Is This Paint Sprayer Designed For? What Types of Painting Jobs are the 390 Best for? The Graco 390 is a solid piece of equipment built for repeated use. It is fairly lightweight and portable at just 30 pounds. Because of the ease of lifting and carrying it can be taken on most any job site with you. This system makes it easy and simple to provide on-the-job Pump Replacement. In just one minute, you can have a new pump in 3 simple steps. This helps to extend the life of the sprayer. Graco offers one of the most reliable pumps available on the market. It tends to last two times longer than other brands and features Long-Life V-Max Blue Packings. It is also made with a Chromex rod and hardened stainless steel cylinder for maximum life. The QuikAccess intake valve allows for fast clean up when the job is done. The vertical design of this unit helps to eliminate any spills. The large 7.8 square-inch filtering area also helps to reduce tip clogs. Thankfully, the flow-through design allows you to clean with only a few gallons of water. The hardened steel gears included with this machine will run at extremely quiet levels. This is due to the high-ration reduction which provides a slow pump stroke. Ideally, this sprayer would be best for a professional contractor who regularly needs to spray materials for the job. It offers a quick and easy setup so you can get to work faster. With the ability to spray up to 0.47-gallons per minute the jobs will also be done quickly. It would also be a great tool for a property manager that wants to handle their own maintenance projects. Instead of hiring a professional every time there is work to be done, the property manager would be able to save money by doing it themselves. In addition, the serious home remodeler or do-it-yourself enthusiast would also find this to be a helpful tool when working around the house. Instead of using the traditional paint rollers and brushes to complete a task, you eliminate much of the time by using a paint sprayer. This paint sprayer can be used by a beginner because it isn’t hard to control. The best thing you could do as a beginning sprayer is to practice before actually starting your project. To do this, simply find a scrap piece of wood or even some cardboard and practice your technique. You’ll also want to adjust the settings and become accustomed to what might work best for your needs. Then, you’ll be able to spray like a professional. Because of the ability of this Graco model to spray most materials such as stains, acrylics, enamels, and latex, you’ll find that it can be used on a variety of tasks. You’ll see that the Graco 390 is capable of handling most of your indoor residential painting jobs. In addition, the exterior of your home always needs some work! 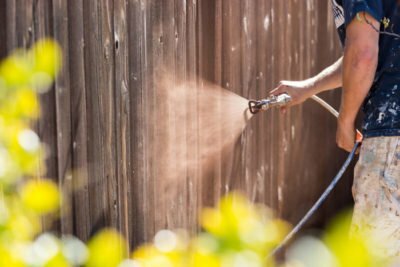 Consider using this sprayer for the house, garage doors, fences and your decks. It is even a great tool for commercial painting jobs and property management. It is possible that you’ll find this unit to be more than what you are in need of. If that is the case, you could take a step backward and purchase the Graco Magnum ProX17 instead. This is a smaller unit and only pumps out 0.34-gallons per minute, but the price does go down quite a bit. If you find yourself in the opposite position where you need something more powerful, you could look towards the Graco Ultra 395PC. This unit can pump up to 0.54-gallons per minute and features 7/8-horsepower. In addition, the maximum tip size on the 390 is only 0.021mm where the Ultra 395PC offers a maximum tip size of 0.023mm. If you are interested in looking at other model sprayers, the Titan XT330 offers 0.38-gallons per minute of spraying capacity with a ¾-horsepower motor and the price is a little lower. The main differences, however, are that the unit is much heavier than the Graco 390 and your maximum tip size is only 0.019mm. In addition, the Titan doesn’t have near as many positive reviews as the Graco brand holds. This is probably due to the fact that Graco 390 offers a more solid build along with the ability to easily change out the pump in case of a problem. If you are serious about getting a professional paint job done on your projects and you want a well-built machine, the Graco 390 is the perfect sprayer for you. It has the capability to blast through projects with ease while being able to perform at top levels for years to come. I recommend this sprayer to any professional contractor, property manager or serious do-it-yourselfer.